Can't believe it is the last day of January already. Where has the time gone? I just wanted to share this photo that I took this morning from out of our forward hatch. Not a bad winter's day, is it? We are anchored in Simpson Bay, Sint-Maarten, Netherland Antilles. Just a 10-minute dinghy ride through the Lagoon over to Marigot, St. Martin (the French side). Hope you had a nice day, too! The charter catamaran Godiva, a 42-foot Fountaine-Pajot Venezia catamaran, has extended their cruising ground and now offers new charter locations. They are available for charter in St. Martin / St Maarten, St. Barths, Guadeloupe, Martinique and Antigua !!! Godiva will also be participating in the Heineken Cup Races (March 3-10, 2008) and the Antigua Races (April 24 - May4, 2008). So book now!! Godiva requests that their guests have two dinners ashore, but they will contribute $100/couple towards the meal. Godiva's has summer (May 1st to mid-December) and winter season rates (mid-December through April 30th). Accommodations for 4 four guests. The en suite aft master has 2 doubles. Guests may choose one of the two forward cabins: V berth with 2 lower singles & filler, or port cabin with upper/lower singles. The forward head is shared with the crew. Reduced Rates on the beautiful Swan 70, Claudia IV - Ship's bar included! Reduced AND re-priced in US dollars, Claudia IV's all-inclusive Caribbean rates are now $20,000/wk for 2 guests, $21,000/wk for 4 guests and $22,000/wk for 6 guests. This rate includes standard ship's bar & beverages, which is unusual for this level of yacht. Claudia IV's accommodations make her ideal for family charters as well as for three couples. This classic Frers Swan 70 offers three double cabins, each with en suite head and shower. The master cabin is aft with a centerline queen, settee and vanity/desk. Two identical guest cabins forward of the salon have one lower double and one single upper Pullman berth each. CREW: British born Captain Mike Watts and his wife, Adele, the chef, have been polishing their hosting skills on charter yachts since 1996. Mike is a mechanical engineer, RYA Yachtmaster, RYA Sailing Instructor and PADI Certified Scuba Instructor. His knowledge of sailing and anchorages throughout the Caribbean is unsurpassed. Adele, who trained at Le Cordon Bleu Culinary Academy in London, has done two circumnavigations and co-owned a dive charter company. CLAUDIA IV is available for summer 2008 charters in the Western Mediterranean at the weekly charter price of € 17,000 Mediterranean, plus all expenses. Due to a cancellation, the 72-foot Hanalei Bay now has two cabins available for their cabin cruise week, February 2-9, 2008. The aft cabin is booked by a Florida couple in their 60's. He is a retired scientist & engineer while she is a stretch exercise instructor. Thus the mid-ship double cabin is available, as well as the aft twin cabin, each with their private, ensuite bathrooms. The twin cabin has two lower twin berths, not bunk beds. The rate is $3500/wk for this cabin cruise. This is the 2-person cabin rate and not for each person. It is all-inclusive except for BVI cruising tax (not much) and guests are requested to have one dinner ashore at their own expense. 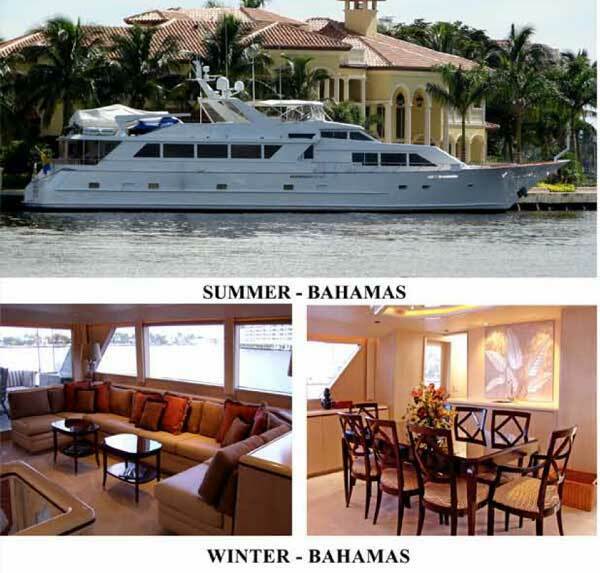 This is an excellent value for such a large, roomy comfortable yacht with excellent food and wonderful hospitality. Come on down and get your toes tan! Don't you deserve a quick getaway? Marolanga is one of our favorite catamarans for crewed charters. We really enjoyed the long Thanksgiving weekend that we spent anchored near Gus & Marcella in Christmas Cove just off of St. Thomas. They are such a warm couple and they love to charter and share their boat, knowledge and islands with their guests. Great for families. Sasha is a very well behaved Persian cat. We've had people aboard Marolanga who said they are allergic to cats but were pleasantly surprised when they had no adverse reactions to this beautiful kitty. It has been almost a full month since our charter on the Marolanga and we are still smiling from the wonderful memories. We would like to share some of our thoughts with you. Our cruise certainly added a fabulous dimension to November 11th, our wedding on Hawksnest Beach on St. John after the cruise which was just like a fairytale. Gus and Marcella were the most accommodating, friendly, gracious hosts we could have asked for. They always made us feel comfortable and tended to our needs and requests. Their European culinary traditions made mealtime a lovely dining experience. Most days, our charter group enjoyed breakfasts with the Continental variety of breads, pastries, meats, cheeses, yogurts and fruits, but they offered eggs, cereal and American style if we desired as well. Interesting lunches of salads and sandwiches and luscious dinners came out of their galley like magic. Each day we found ourselves at a new anchorage of indescribable beauty. Some highlights for us: we were personally entertained by Foxy himself on Jost Van Dyke; we were thrilled by the gin clear water for snorkeling and vast array of sea life at the Indians; we were overwhelmed by the natural beauty at the Baths on Virgin Gorda. Wow!! We feel so very privileged! Before and after our cruise, Bill and I stayed on St. John at Estate Lindholm—a delightful bed and breakfast with comfortable rooms and an incredible view—a place we would highly recommend. The grounds were botanical garden-like with birds, butterflies, tree frogs and such. Just delightful!! Innkeepers, Lauren and Brion Morrisette were the land equivalent to Gus and Marcella. Also, we would like to thank you for your services at Paradise Connections. We had contacted several charter companies, but you seemed genuinely interested in meeting our needs and communicating with us. We are so glad you did! Finally, we are all dreaming and talking about our next cruise together. That should speak clearly about how much we loved our trip. We would feel like we were coming back to family with Gus & Marcella. did for us and all you shared with us. Take care and fair winds to you. Just wanted to take a moment and drop you an e-mail to let you know what a great charter we had with Gus and Marcella. They are the most wonderful people - hard to believe they have been sailing the BVI's for 14 years together. They act like they are still on their honeymoon. We probably visited 10 or more islands and bays and took a lot of pictures. Thank you for recommending the Marolanga to us for our charter - it was perfect. Plenty of room on the boat, food was great and spending time with Gus and Marcella was a pleasure. It was so nice not having a firm agenda - we could sleep until 8, have breakfast, snorkel, sail awhile, snorkel again, sail, have lunch, etc. Life is good!